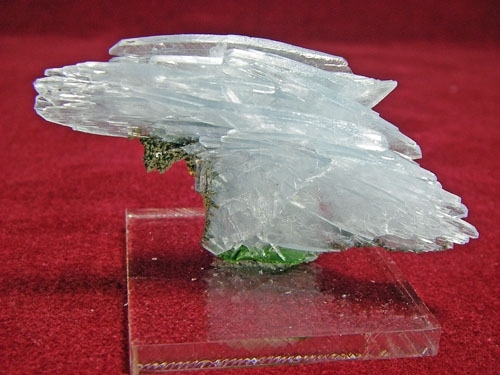 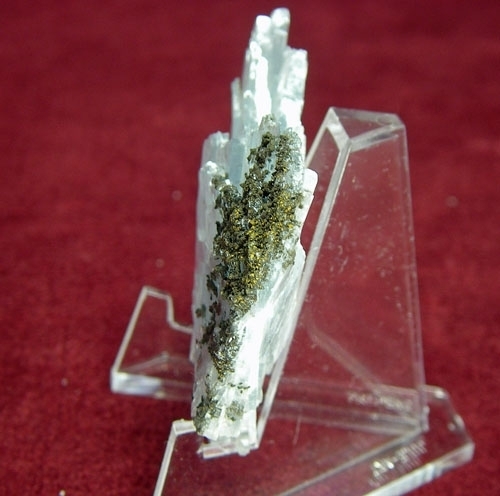 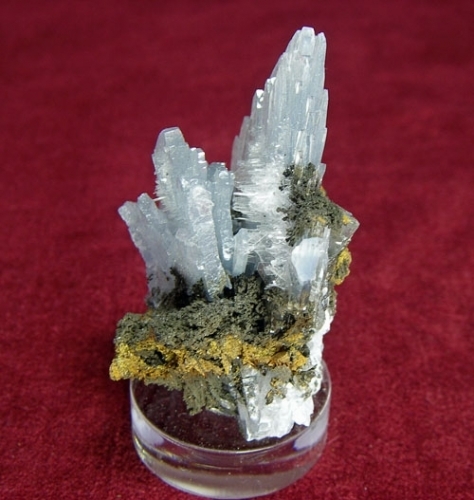 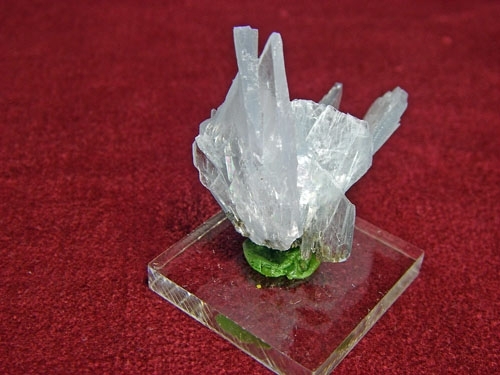 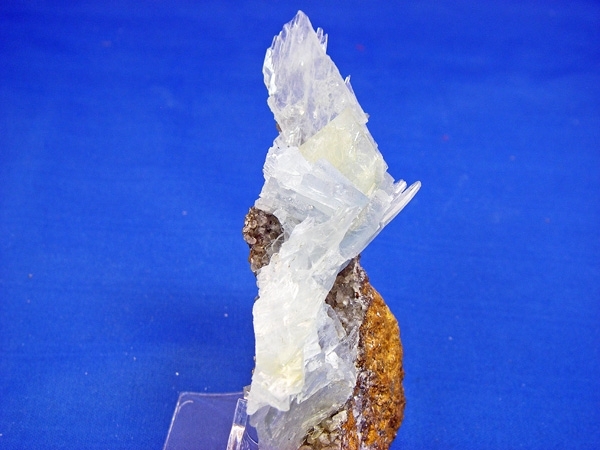 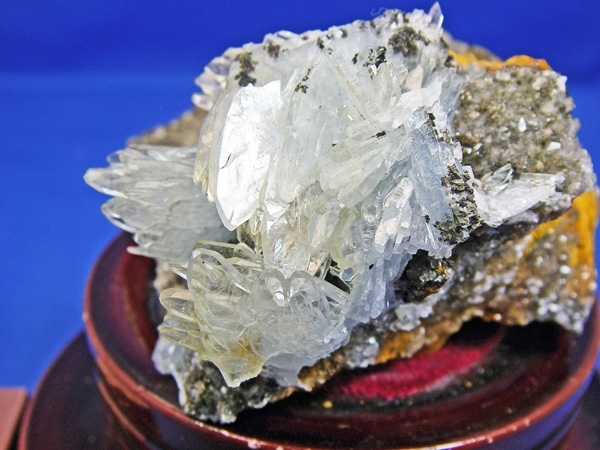 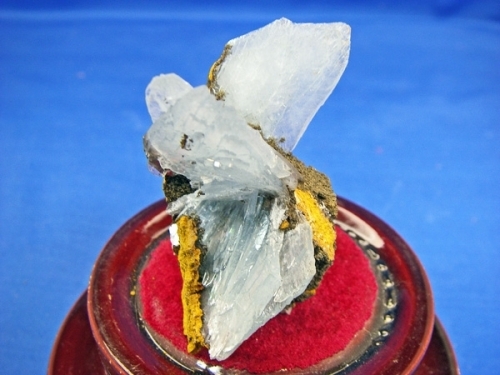 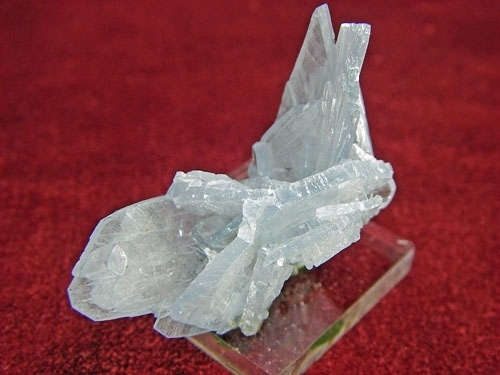 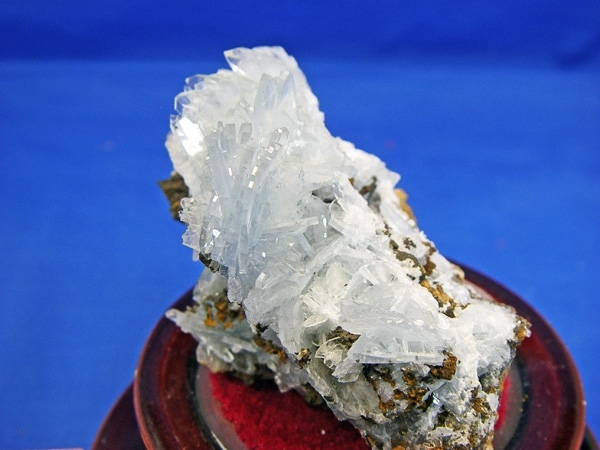 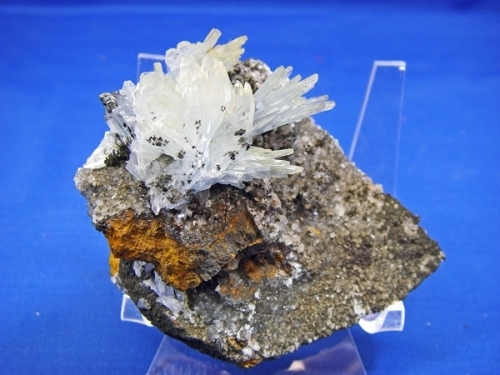 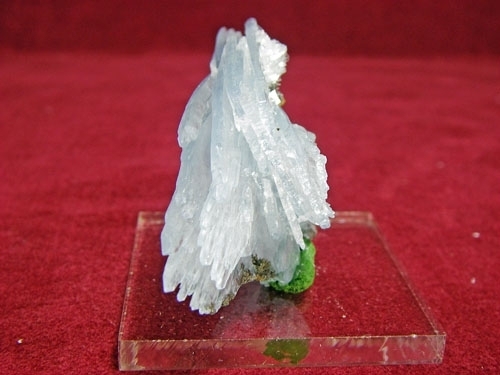 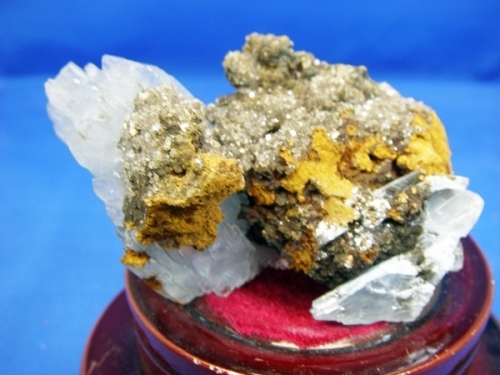 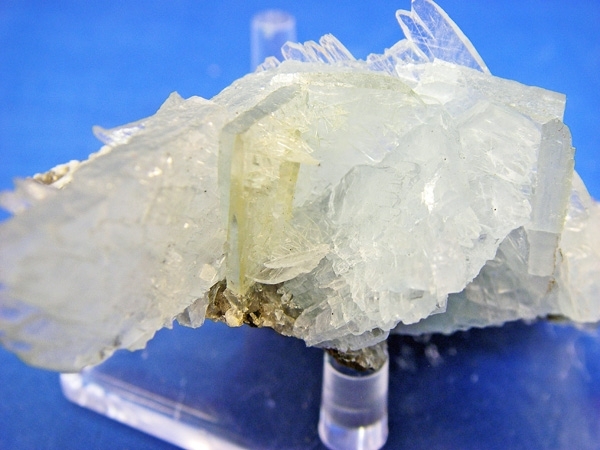 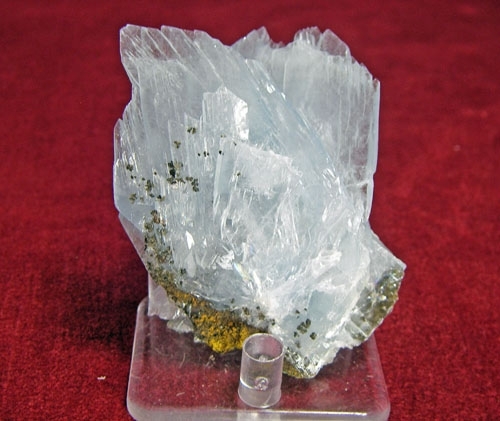 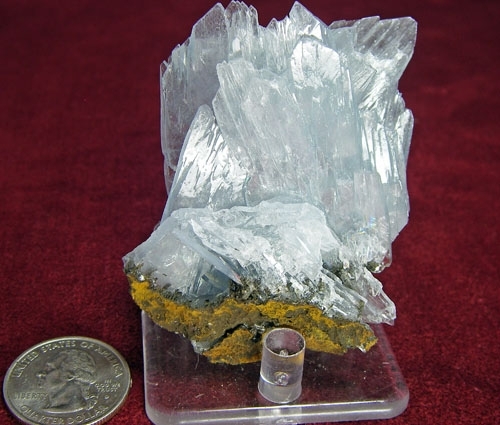 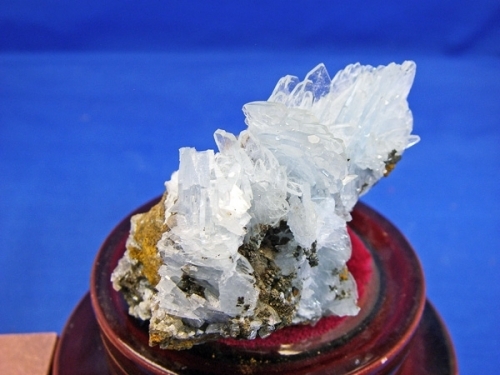 WHAT IS THE MINERAL BARITE (AKA BARYTE)? 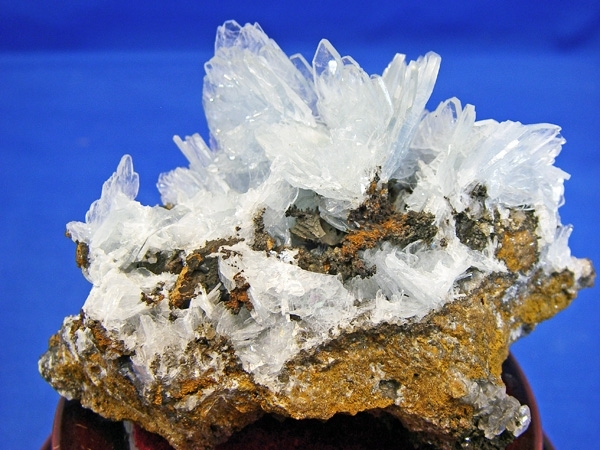 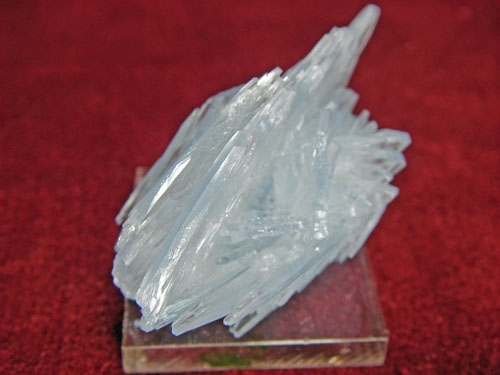 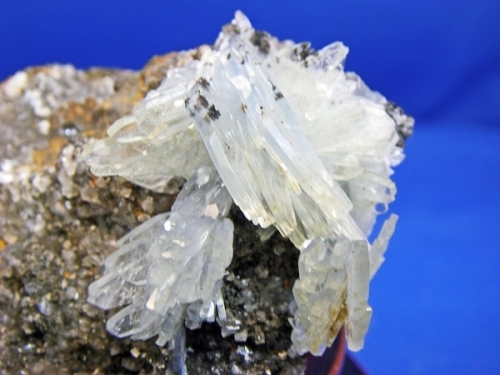 BARITE IS BARIUM SULFATE, BaSO4. MOST BARIUM (77%) IS USED AS A WEIGHTING AGENT IN DRILLING FLUIDS FOR GAS & OIL EXPLORATION. 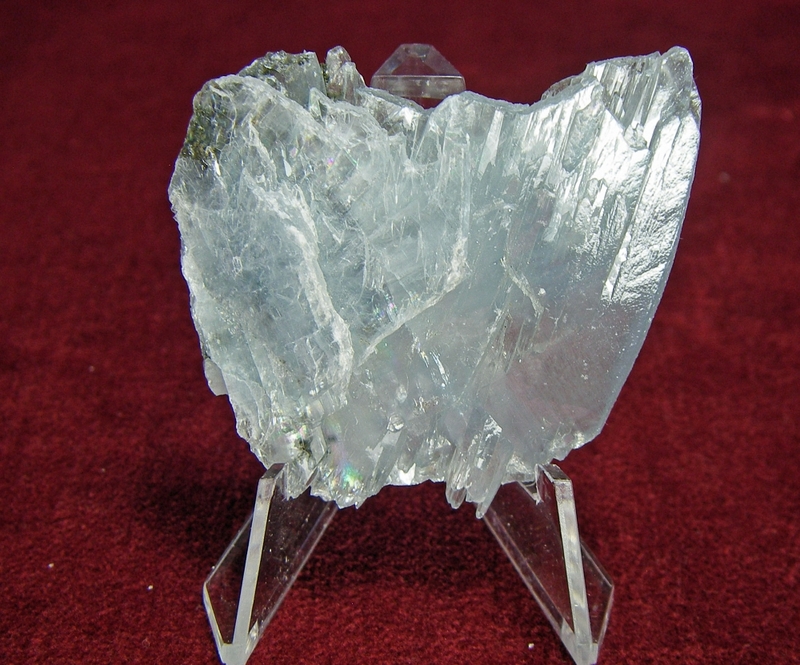 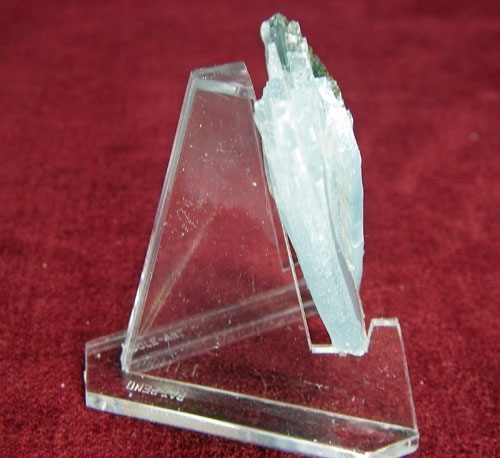 THE CRYSTAL STURCTURE IS ORTHORHOMBIC (TABULAR & FIBROUS). 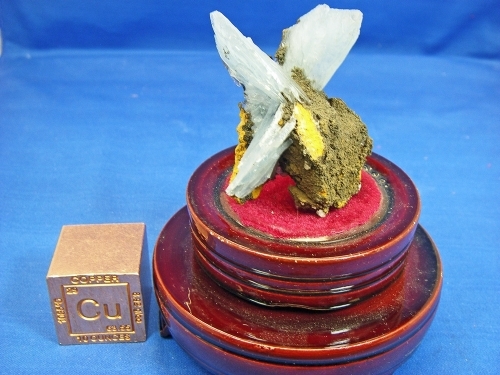 THESE SPECIMENS MAKE AN EXTREMELY NICE DISPLAY!. 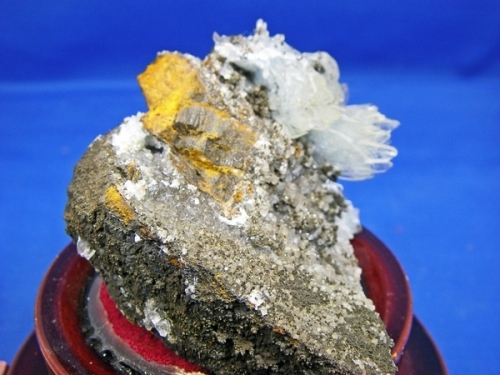 CLICK ON PICURE TO SEE MORE. 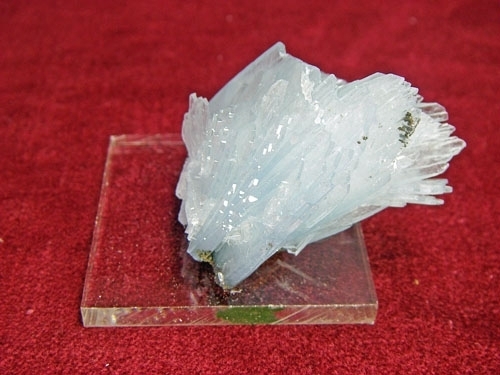 BLUE BARITE (BARYTE) CRYSTALS FROM SIDI LAHCEN, NADOR, MOROCCO. 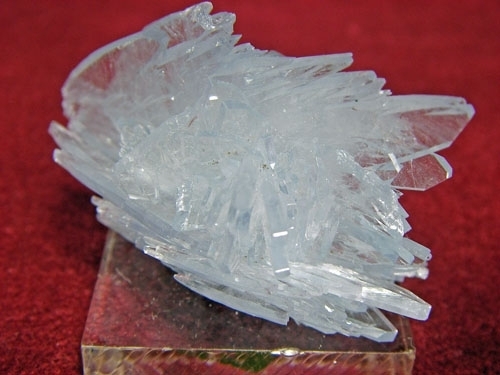 BEAUTIFUL GROUP OF LARGE BLUE CRYSTALS! THIS SPECIMEN IS 1 3/4" L X 2" W X 1 1/2" H AND WEIGHS 3.73 OUNCES WITH ACRYLIC BASE THAT IS INCLUDED. 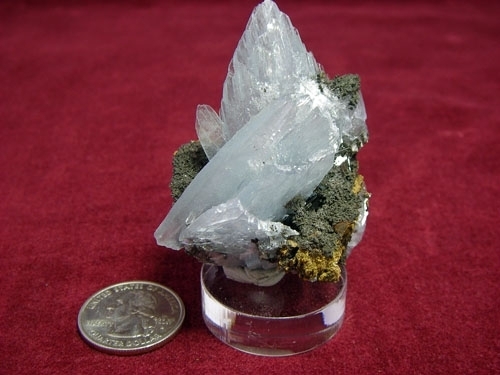 ONE YOU HAVE TO HOLD IN YOUR HANDS TO APPRECIATE THE FULL BEAUTY OF THIS SPECIMEN! BLUE BARITE (BARYTE) CRYSTALS FROM SIDI LAHCEN, NADOR, MOROCCO. 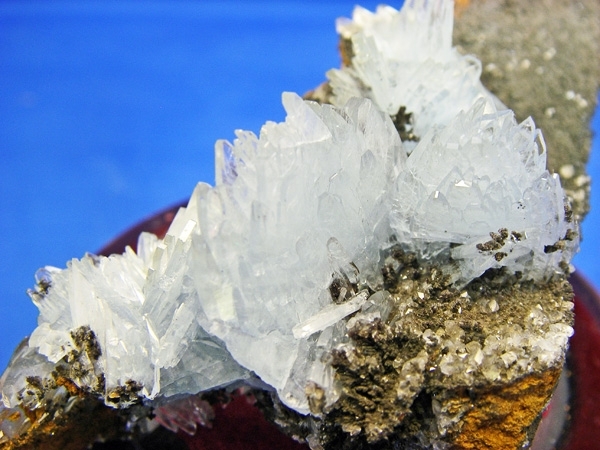 BEAUTIFUL GROUP OF LARGE BLUE CRYSTALS, WITH SOME MATRIX! 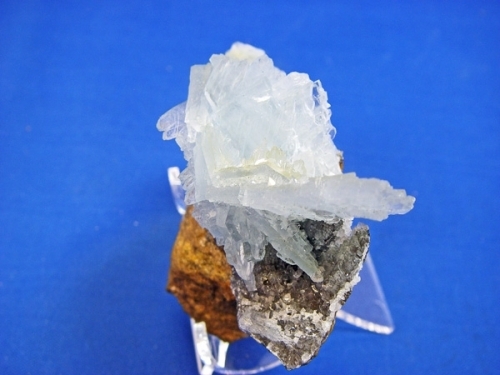 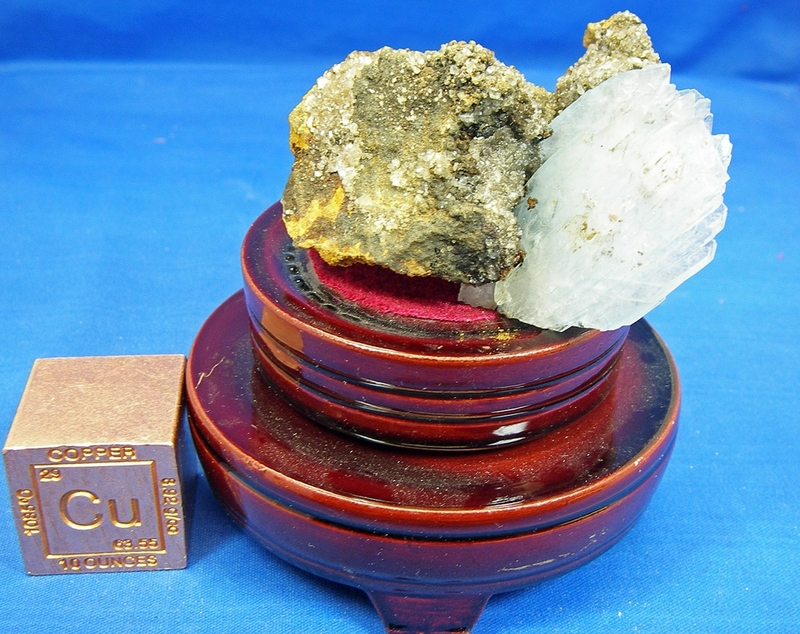 THIS SPECIMEN IS 4" L X 1" W X 1 3/4" H AND WEIGHS 2.65 OUNCES WITH ACRYLIC BASE THAT IS INCLUDED. 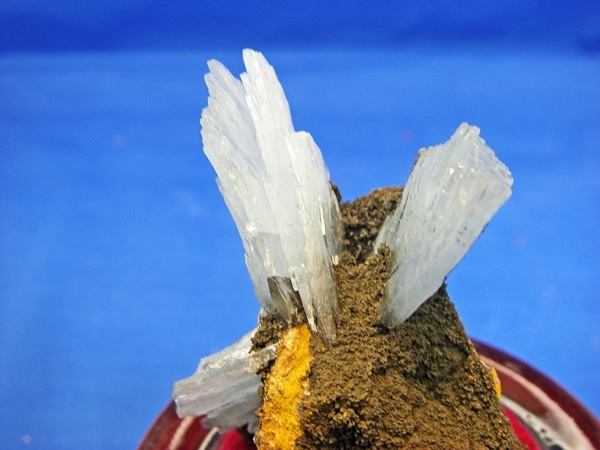 A FLYING WING OF CRYSTALS - AMAZING DISPLAY! 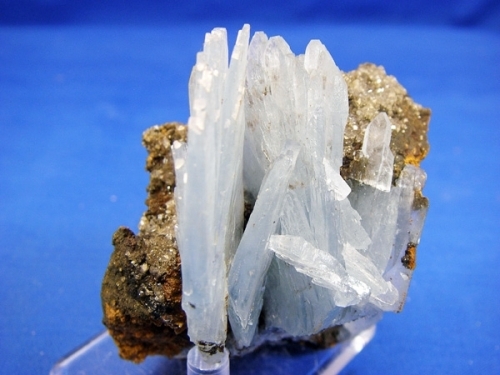 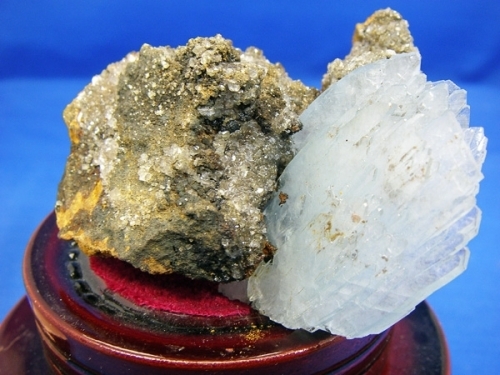 BLUE BARITE CRYSTALS FROM SIDI LAHCEN, NADOR, MOROCCO. 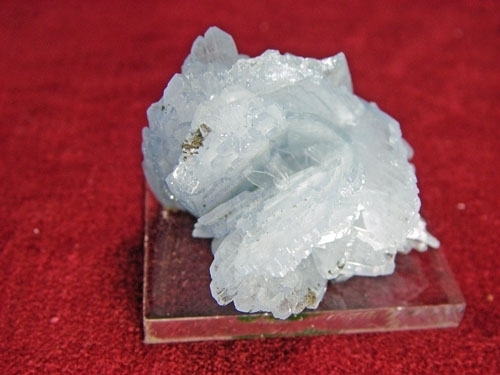 BEAUTIFUL GROUP OF EXTRA LARGE BLUE CRYSTALS, ON MATRIX! 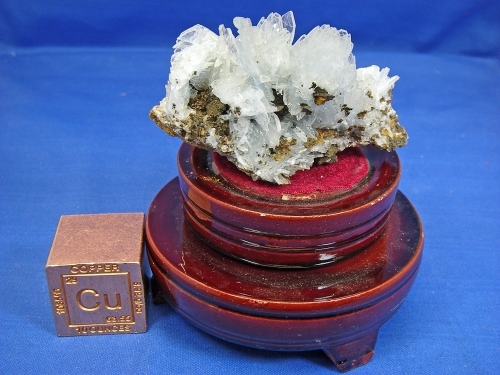 THIS SPECIMEN IS 4" L X 2 1/2" W X 2" H AND WEIGHS 7 OUNCES. SHOWY SPECIMEN WITH LOTS OF BARITE! ACRYLIC BASE INCLUDED. 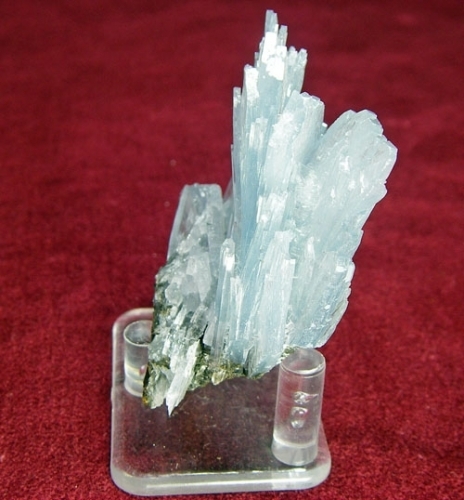 BLUE BARITE CRYSTALS FROM SIDI LAHCEN, NADOR, MOROCCO. 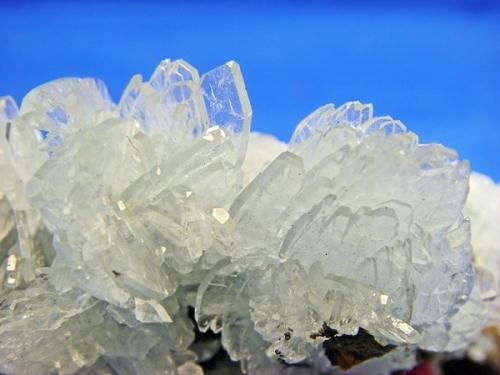 BEAUTIFUL GROUP OF LARGE BLUE CRYSTALS, ON MATRIX! 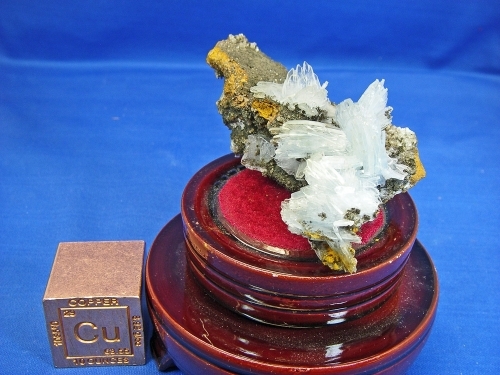 THIS SPECIMEN IS 3 1/2" L X 2 1/2" W X 2" H AND WEIGHS 6.6 OUNCES. 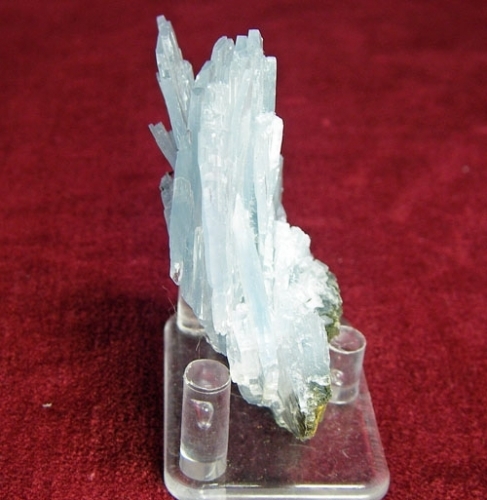 NICE FREE STANDING OR STAND DISPLAY OF BLUE BARITE CRYSTALS! 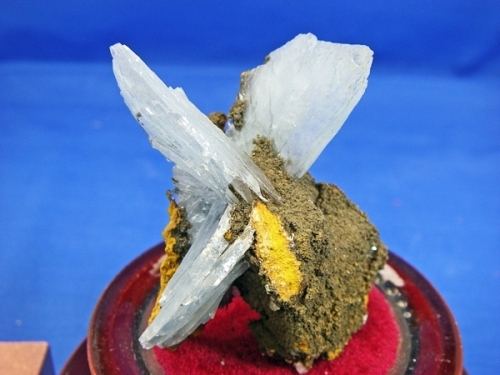 REPORTED THAT THIS VEIN OF BARITE HAS RUN OUT AND THE MINE IS CLOSED. BLUE BARITE CRYSTALS FROM SIDI LAHCEN, NADOR, MOROCCO. BEAUTIFUL GROUP OF LARGE BLUE CRYSTALS, ON MATRIX! 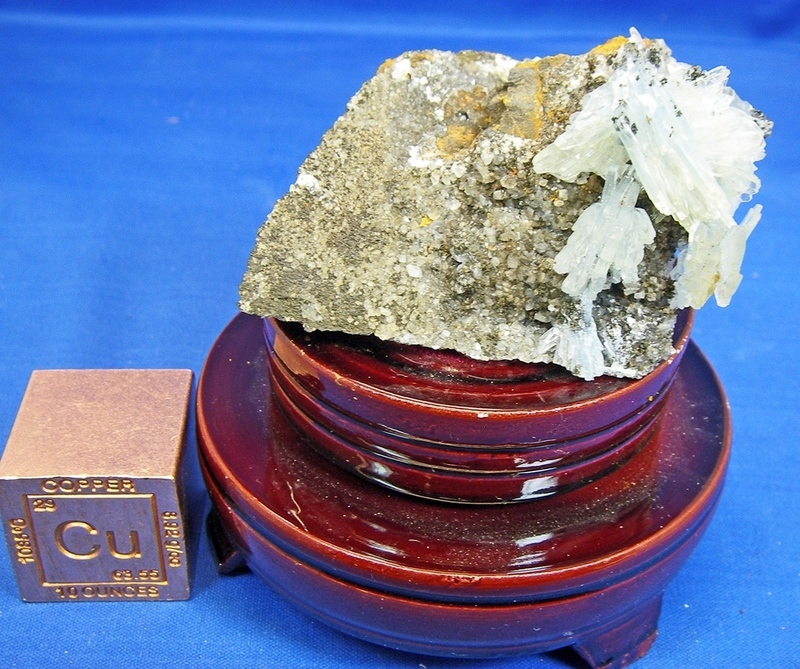 THIS SPECIMEN IS 3 1/2" L X 1 1/2" W X 2 1/2" H AND WEIGHS 5.93 OUNCES. 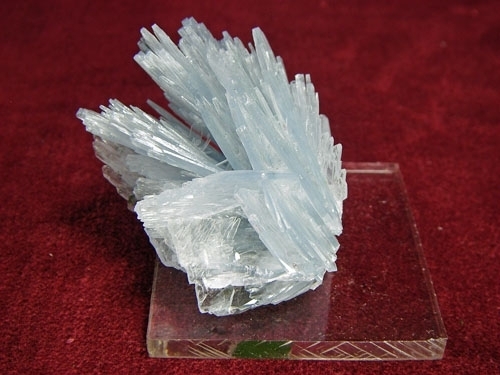 NICE STAND DISPLAY OF BLUE BARITE CRYSTALS! 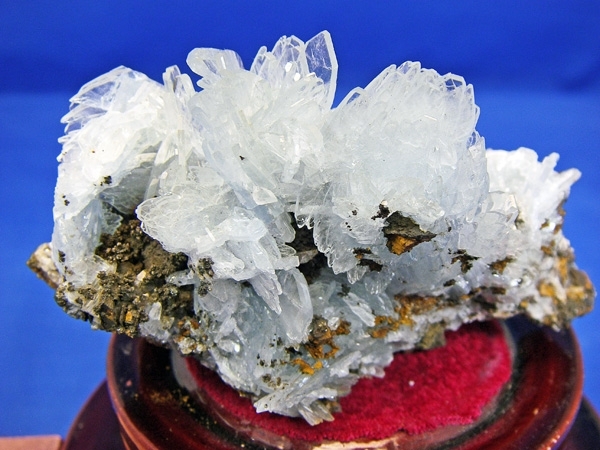 BLUE BARITE CRYSTALS FROM SIDI LAHCEN, NADOR, MOROCCO. 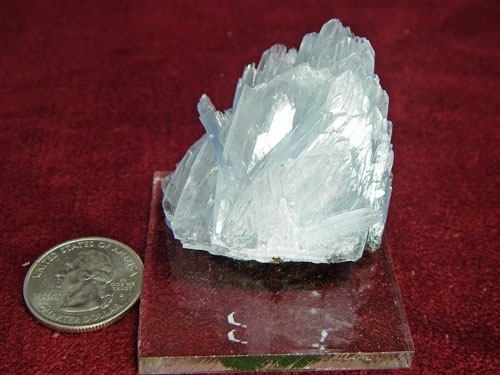 BEAUTIFUL GROUP OF LARGE BLUE CRYSTALS, ON MATRIX! THIS SPECIMEN IS 3 1/2" L X 2" W X 2" H AND WEIGHS 5 OUNCES. 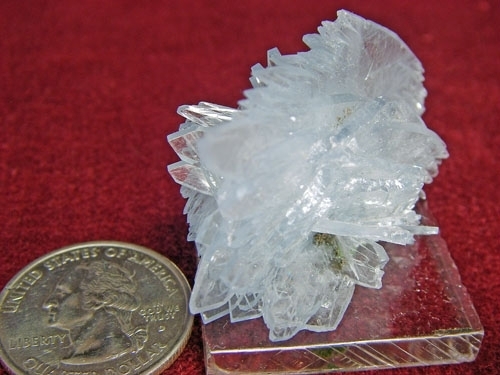 FANTASTIC CRYSTAL TERMINATIONS ON THIS SPECIMEN! ACRYLIC BASE INCLUDED. 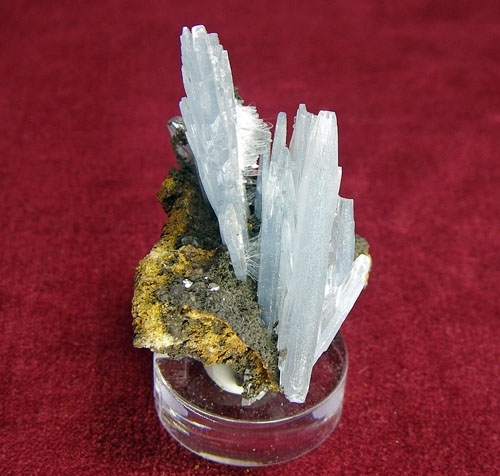 BLUE BARITE CRYSTALS FROM SIDI LAHCEN, NADOR, MOROCCO. 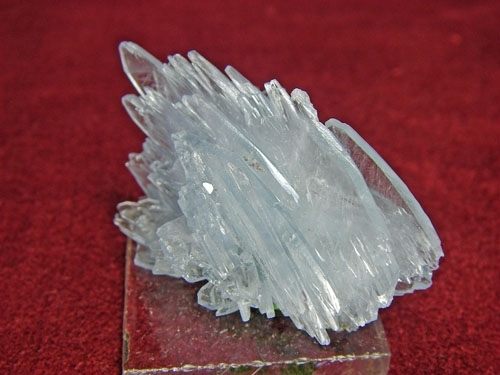 BEAUTIFUL GROUP OF LARGE BLUE CRYSTALS, ON MATRIX! 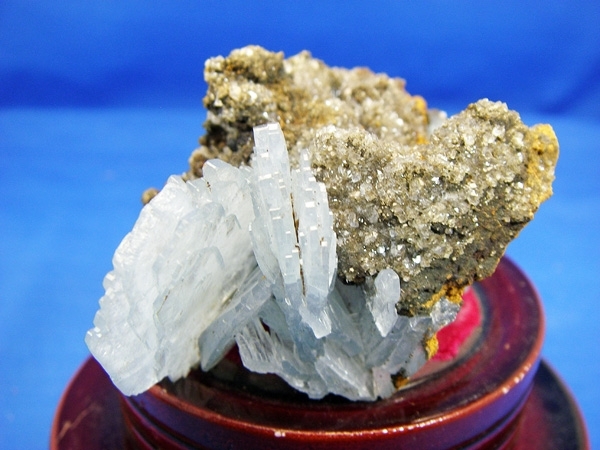 THIS SPECIMEN IS 2 3/4" L X 2" W X 3" H AND WEIGHS 7.4 OUNCES. 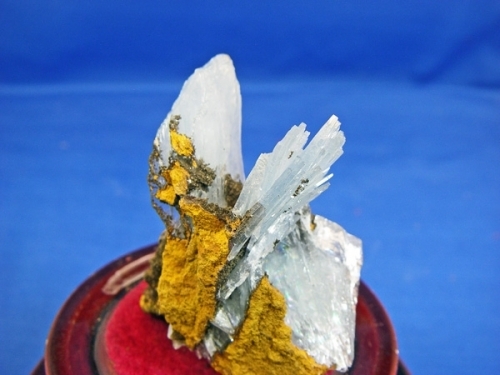 SHOWY SPECIMEN! ACRYLIC BASE INCLUDED. BLUE BARITE CRYSTALS FROM SIDI LAHCEN, NADOR, MOROCCO. BEAUTIFUL GROUP OF LARGE BLUE CRYSTALS, ON MATRIX! THIS SPECIMEN IS 2" L X 1 1/2" W X 2" H AND WEIGHS 2.84 OUNCES. 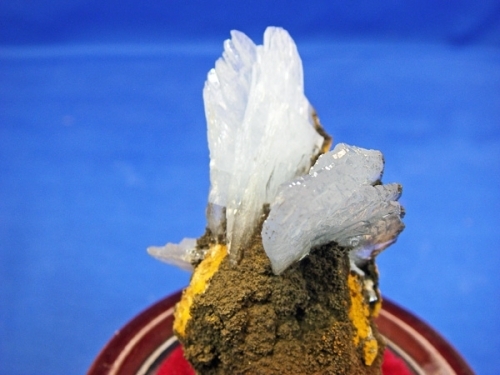 GREAT CRYSTALS ON THIS SPECIMEN! ACRYLIC BASE INCLUDED. BLUE BARITE (BARYTE) CRYSTALS FROM SIDI LAHCEN, NADOR, MOROCCO. 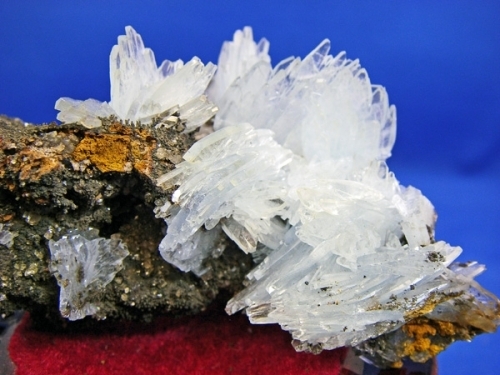 SOLID MASS OF CRYSTALS FOR YOUR STUDY AND ENJOYMENT. 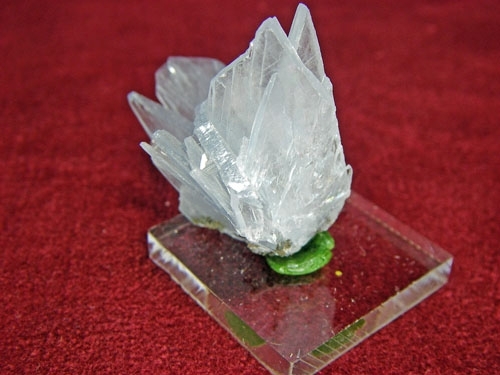 THIS SPECIMEN IS 2" L X 1" W X 1 1/2" H AND WEIGHS 1.75 OUNCES WITH ACRYLIC STAND THAT IS INCLUDED. 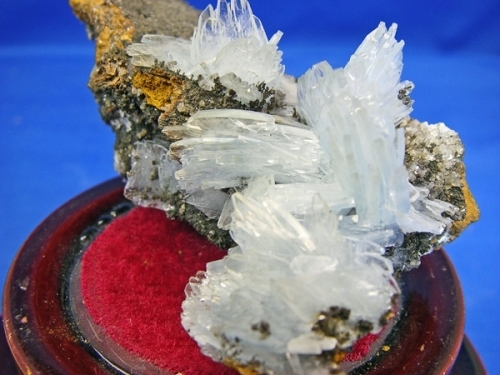 REALLY NICE COLOR! BLUE BARITE (BARYTE) CRYSTALS FROM SIDI LAHCEN, NADOR, MOROCCO. 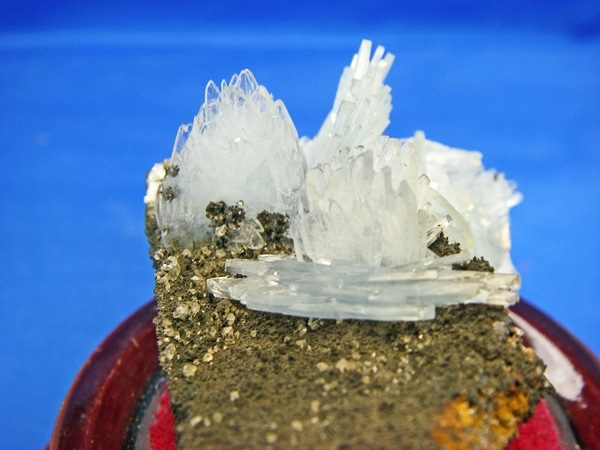 SOLID MASS OF CRYSTALS FOR YOUR STUDY AND ENJOYMENT. 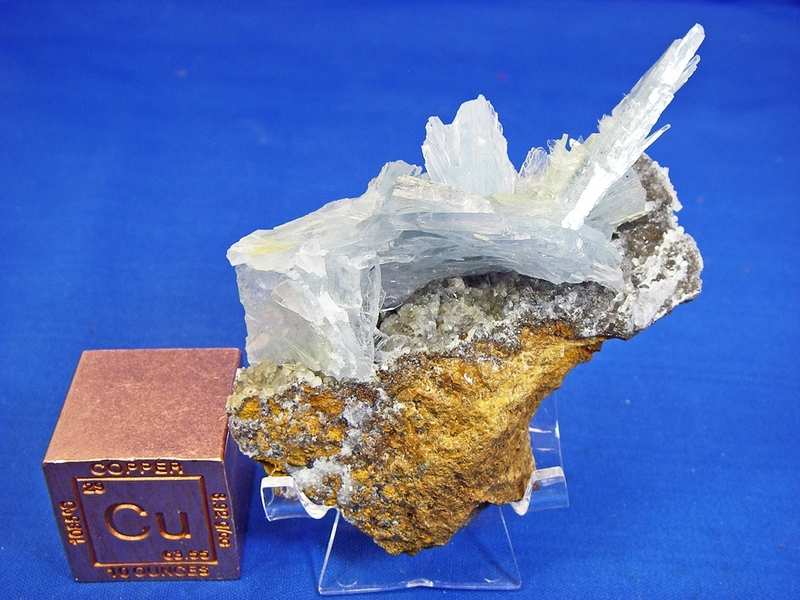 THIS SPECIMEN IS 1 1/2" L X 1" W X 1 1/2" H AND WEIGHS 1.14 OUNCES WITH ACRYLIC STAND THAT IS INCLUDED. 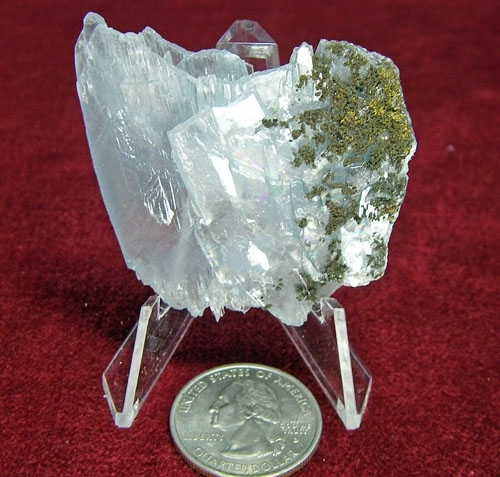 EXCELLENT SMALLER SPECIMEN! 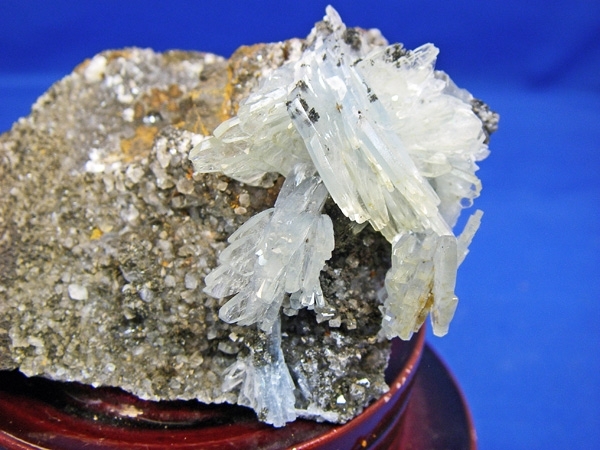 BLUE BARITE (BARYTE) CRYSTALS FROM SIDI LAHCEN, NADOR, MOROCCO. 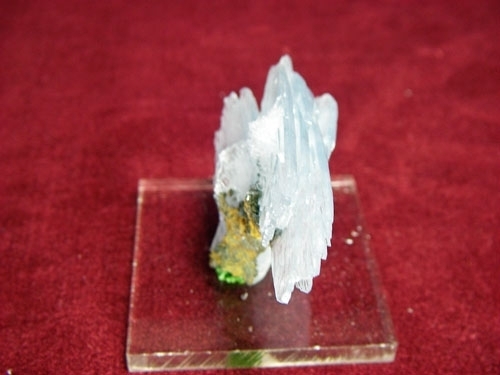 BEAUTIFUL BLUE CRYSTALS IN MATRIX! THIS SPECIMEN IS 2" L X 1 1/2" W X 2 1/2" H AND WEIGHS 3.28 OUNCES WITH ACRYLIC STAND THAT IS INCLUDED. 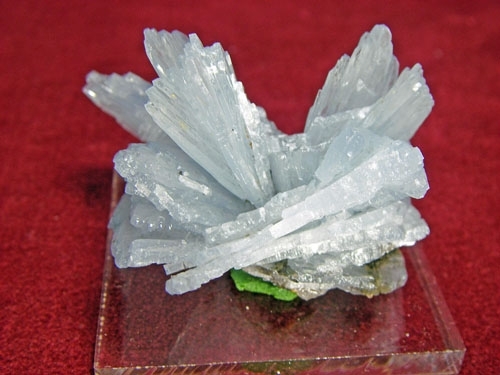 VERY SHOWY SPECIMEN! 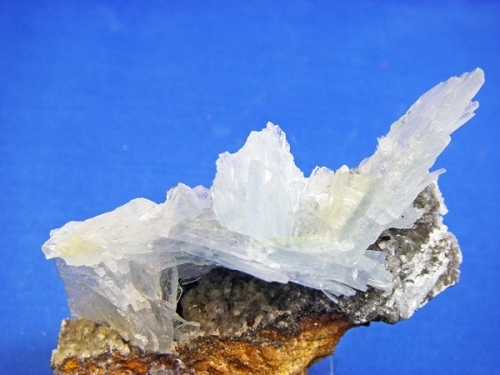 BLUE BARITE (BARYTE) CRYSTALS FROM SIDI LAHCEN, NADOR, MOROCCO. 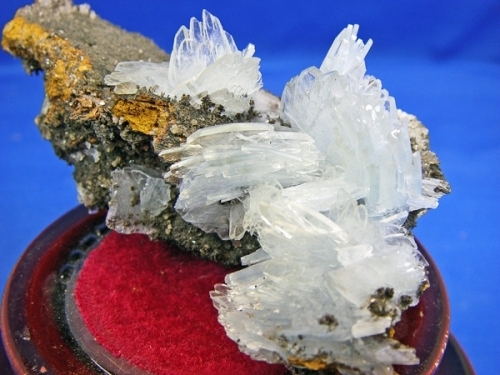 BEAUTIFUL BLUE CRYSTALS WITH SOME MATRIX! 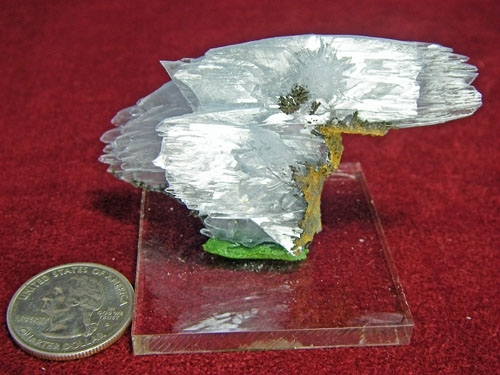 THIS SPECIMEN IS 2" L X 1/2" W X 2" H AND WEIGHS 1.75 OUNCES. 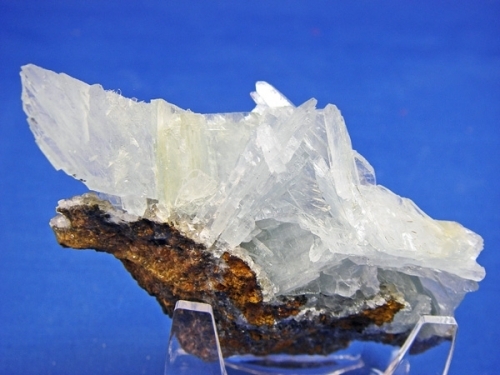 NICE SPECIMEN - GOOD COLOR! BLUE BARITE (BARYTE) CRYSTALS FROM SIDI LAHCEN, NADOR, MOROCCO. 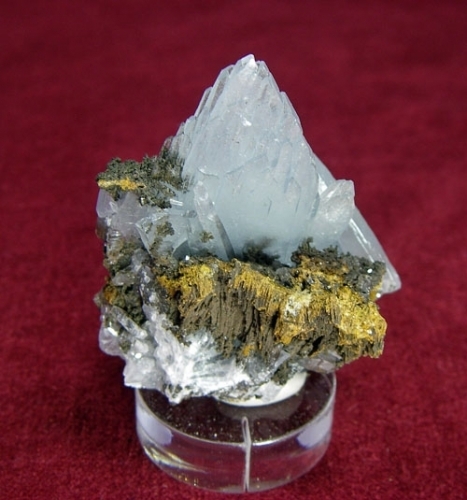 BEAUTIFUL LARGE BLUE CRYSTALS WITH A LITTLE BASE MATRIX! THIS SPECIMEN IS 2 1/4" L X 2 1/4" W X 1 1/2" H AND WEIGHS 4.18 OUNCES WITH ACRYLIC BASE THAT IS INCLUDED. NICE SIZE SPECIMEN FOR DISPLAY - GREAT COLOR AND CRYSTALS! 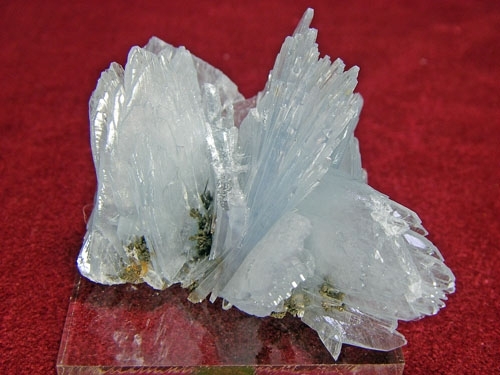 BLUE BARITE (BARYTE) CRYSTALS FROM SIDI LAHCEN, NADOR, MOROCCO. 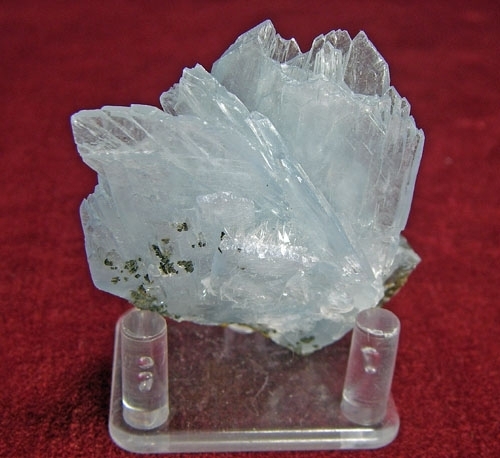 BEAUTIFUL MASS OF LARGE BLUE CRYSTALS WITH A LITTLE BASE MATRIX! 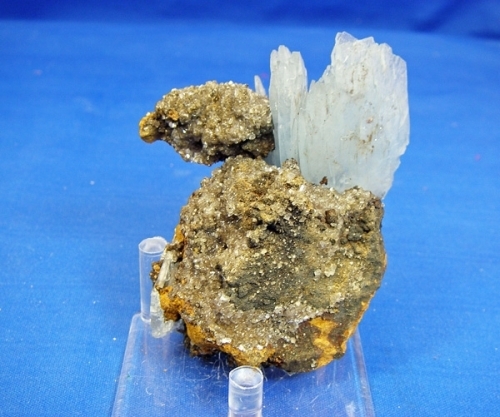 THIS SPECIMEN IS 2 1/4" L X 3/4" W X 2 1/2" H AND WEIGHS 3.8 OUNCES. 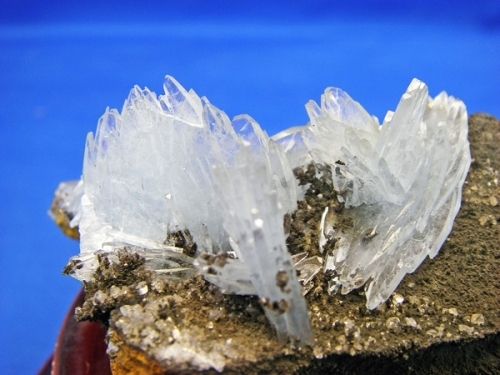 NICE FAN DISPLAY OF THE CRYSTALS!